The 9th Annual Real Estate Symposium, an exclusive alumni-only educational forum, took place on Monday, December 12, 2016 at the Columbia University Club of New York. Roy March, Chief Executive Officer of Eastdil Secured delivered the opening keynote, and Scott Malkin, Founder and Chairman of Value Retail delivered the closing address. See photos from the sold out event here. 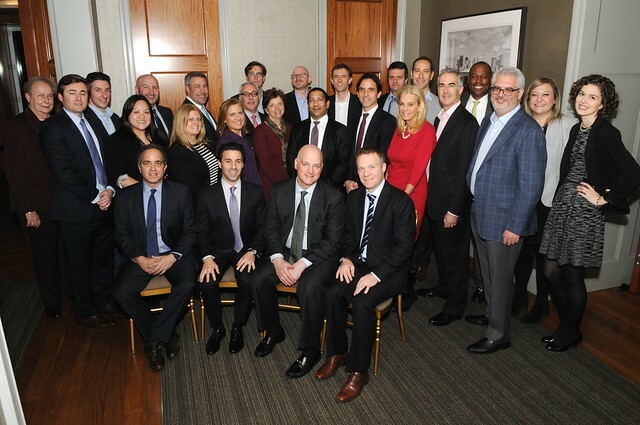 Nicholas Bienstock ’96, Savanna; Cia Buckley Marakovits ’93, Dune Real Estate Partners; Tommy Craig ’82, Hines; Gideon Gil ’00, Cushman & Wakefield; Michael Lehrman ’90, CCRE; Scott Meyer ’14, LeFrak; David Sherman ’82, Metropolitan Real Estate; Raphael Sidelsky ’99, C-III Capital Partners.